A spacious, one-bedroom apartment in Barcelona, located in Vila Olímpica, situated close to the Icaria Movie Theaters and just a few meters from the beach. 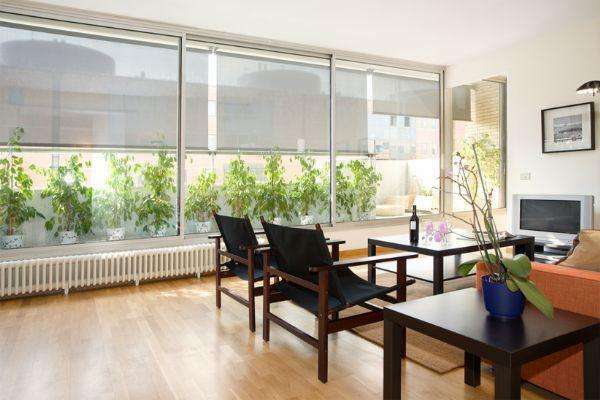 With easy access to a supermarket and shopping mall, this bright Barcelona apartment sleeps up to 4 people. The sunny bedroom has a double bed, plenty of storage space and access to a terrace with beautiful sea views. The living room has large windows which fill the room with natural light. With a sofa bed, TV and coffee table, this room is perfect for relaxing after a long day of sightseeing. An Internet connection is also available, making it easy to stay in touch with friends and family back home. The fully equipped kitchen is also very well-lit and has a microwave, oven, cooker, kettle, coffee maker and toaster. Crockery and cutlery are provided and there is a separate dining area with a table and four chairs. The bathroom is modern and simple with a bathtub/shower. This warm and welcoming apartment, complete with heaters and air-conditioning, offers the perfect base for your trip to the Catalan capital, any time of the year! Please note: Parking is available for an additional 10 euros per night.